Apparently people actually read this blog so I thought I’d give a quick summary of my time at Cosyne. I enjoyed the conference a lot and definitely felt like I got much more out of it than at SfN, although this was possibly because the schedule was much more packed than at SfN. The workshops, ad-hoc discussions, talks and posters were all fantastic, and I totally recommend Cosyne for anyone in the computational/systems neuroscience field. I’ll just mention three “extra-curricular” highlights from the main meeting, outside the main talks and posters. The first highlight of the conference was Greg Gage from Backyard Brains, who presented the second opening presentation. If you haven’t heard of it, Backyard Brains provides DIY kits for performing your own simple neuroscience experiments. The kits are mainly aimed at educating children, but have been brought on the road to bring neuroscience to all over the world, including all seven continents and even on a plane. At Cosyne, Greg talked about the initiative but also had hilarious and interesting live demos with volunteers from the audience. There was a bug that was anaesthetised then subsequently recorded action potentials from, as well as a “brain-machine interface” with one volunteer controlling another volunteer’s arm using EMG. All this was very fun to watch but what I particularly liked about the presentation was how it showed that sometimes in the ivory tower of academia scientists can take things too seriously, but really it can be lighthearted and fun, as Greg showed us. The next “non-scientific” highlight was Wei Ji Ma from NYU on the second day, who presented his experiences “Growing Up in Science”. The words “honest” and “frank” came up a lot when we were discussing his talk afterwards, and it was certainly that. Not only did he impart valuable advice, he also showed through sharing his experiences that the path to science may not be easy or straightforward, but it can still work out even if you feel like you’re struggling, and that to feel like you’re struggling is not uncommon. Definitely check out the series growing up in science for more resources on the subject. He also pointed us to the paper Expectations of brilliance which relates gender disparity variation in different subjects to differing “expectations of brilliance” across those fields. The third day had the “Equality and Diversity luncheon”, formerly for women at Cosyne but this year extended to a wider audience in light of the recent political climate. This event mostly consisted of group discussions over lunch on issues concerning women and minorities in academia and included a panel that shared their personal experiences and perspectives. Three things stood out from this event. The first was a brilliant analogy from Kay Tye from MIT who illustrated why colleagues and peers sometimes might not “get” that there is a gender problem. 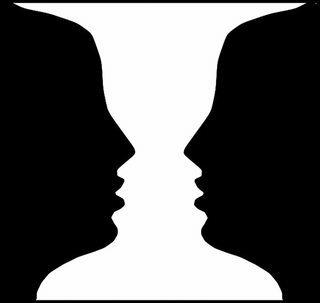 She compared the situation to case of the face/vase illusion; as in, once you see it (gender discrimination), you can’t unsee it. This was relevant in light of some of the panelists who noted that they often didn’t truly experience gender discrimination until they got to the faculty level, at which point it was starkly clear. Conversely, as in the case of the illusion, if you can’t see the other side, you just can’t see it and don’t know what others are talking about. For me this was a funny and apt way of describing the situation in academia - with some being keenly aware of the problem and others thinking there isn’t a problem until they see it for themselves. The second point of interest came from my own thoughts regarding the belief that the leaky pipeline occurs because women often “choose” to leave for reasons such as family. Megan Carey from the Champalimaud pointed out this couldn’t be the only explanation, as minorities also face the leaky pipeline problem, yet male minorities don’t have to, for example, take time off to have a child. This led me to think that even if it could be argued that women “choose” to leave academia, contributing to the leaky pipeline, this choice is severely constrained by systemic biases that affect women more than men. That is, for example, things like returning after maternity leave can be much more difficult for women than men, so women may “choose” to leave academia under these conditions, but more because of the factors against them, rather than making the choice entirely freely. Finally, Megan Carey ended with a great, pragmatic point why everyone in academia should care about gender diversity. That is, as a discipline, we are interested in recruiting and retaining the best talent to advance scientific progress; therefore, if we don’t include women and minorities, we are missing out on lots of potential talent. So, whether the reasons are personal or pragmatic, there should be no case against equality and diversity in science. Those were the three “non-academic” highlights from the main conference, and I really appreciated how the organising committee took a broader view and included “meta-scientific” events as well as talks and posters. Cosyne really felt like a “community” of scientists, especially compared to the large, more anonymous SfN. The workshops were also unmissable, so I recommend going for the whole conference and workshops if you can. Cosyne provides travel grants to first-time attendees, highly-scored presenters, and undergraduates, or you can volunteer and have your registration fees waived.